This Saturday will be the three-year anniversary of the February 22, 2011 Christchurch earthquake. 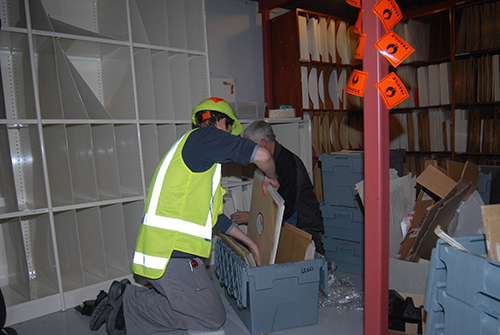 The Sound Archives Ngā Taonga Kōrero main office was forced to move to new premises following the earthquake, where they remain today. SANTK Preservation Archivists John Kelcher and Marie O’Connell tell us about the effects of the earthquakes on their work and the post-quake recovery efforts. 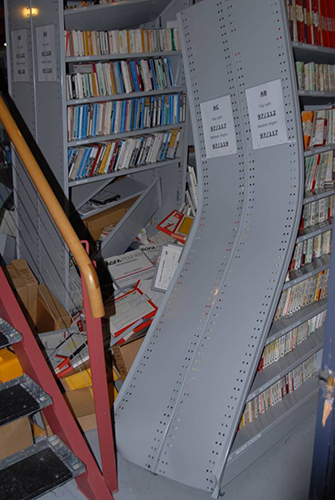 When a shallow magnitude 6.3 earthquake struck Christchurch in February 22nd 2011 Sound Archives was literally thrown into a state of chaos. Our damaged building was left inaccessible and staff were stood down until temporary premises were found. The inner city was locked down and many people in the suburbs were living day-to-day, struggling to provide the basics of life. In the weeks that followed, people throughout the city found themselves having to make difficult snap decisions about their work, homes, families and relationships. It was as if life had been switched into fast forward. 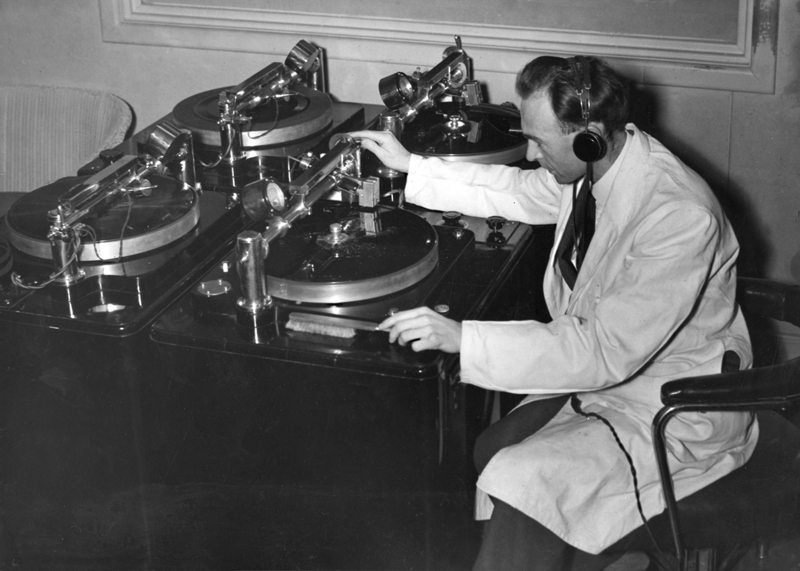 Once we had attended to our immediate needs, staff gathered at Radio New Zealand’s new base at the Camelot motel on Papanui Road. Here we started to plan the archive recovery operation. Red and Orange zone access was tightly controlled but finally we were able to enter the building and see the state of the archive. The plan for the recovery operation was to be well resourced and based around a small team of archivists and a trusted moving company. Being locked out of our building, we had plenty of time to plan the recovery operation, though there were many variables to juggle and we were never completely sure when and for how long we would be allowed in. There was a risk that water was entering the archive and we could have a mould outbreak. Despite the obvious building damage and lack of flashings on the west wall, there were no leaks. We were lucky there were no serious sou’westers, and that autumn and winter were exceptionally dry and mild. Just about every collection in the city was badly affected. Traditional library shelving does just not hold up in these kinds of events. After several months we managed to find new rental premises, which included a reasonable sized storage area. We planned the new Cashel Street archive layout based on light-grade warehouse shelving (dyna-bolted to the floor) and sturdy polypropylene crates. The risk assessment for the Health and Safety Plan was an interesting exercise. The greatest risk factors that could not be eliminated, minimized or isolated were “emotional stress” and more earthquakes. This was reassuring to me, because the building, though very cold, was fine to work in and it turned out that the team worked exceptionally well together. The most stressful part was waiting to get in. Once we were there we soon settled into a fairly brisk, but not hurried routine. We made a point of having a number of archivists in the team. This was important because together we were able to make sure the handling and record keeping was methodical. We used crate log sheets and took photographs of crate contents. This made the sort process a lot more efficient. 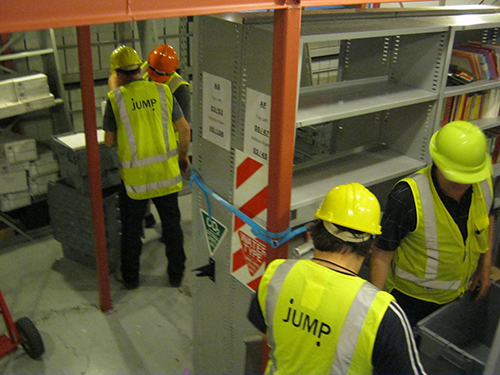 ‘Jump’ movers turned out to be a great little family firm who really took our special archival concerns on-board. There were no food outlets operating in the city, so their tasty lunch-time barbequed burgers were a real treat. As for more earthquakes, yet again, the old leviathan would have the last word. On Monday the 13th of June at lunchtime, from across the road, I watched the front of the building flex as a shallow magnitude 5.9 hit. Tony, Robyn and Nathan ran from the barbecue under the drive-through beneath the archive (not the best evacuation practice). Nick Guy and Matthew O’Sullivan were in the archive and Doug and I met them on their way out, a little shaken but O.K. The June the 13th quake meant we were locked out for another week until our engineer cleared the building. There was little noticeable external damage, though inside we noted more broken windows, cracked gib and lifting carpet tiles. Good thing we weren’t working on the last row, as two of the heavy wooden units toppled spilling a thousand or more lacquer discs on the floor. As well as recovering the archive we retrieved other Radio New Zealand Christchurch equipment and personal items. At first the new warehouse space was full of pallets of grey security crates and boxes. We installed air-conditioning and temperature and humidity monitoring. We manually moved tons of archival holdings already in situ to install the shelving. We also though hard about potential hazards in our new location and took extra care with our security arrangements. The next phase was the archive reinstatement project. Marie O’Connell and I worked in tandem with our cataloguers to ensure that all sorted items were married up to carrier records in our archival database. We physically reordered series, storing like formats together. We made good use of the crate logs and plastered a whole wall with printouts of the crate photos. 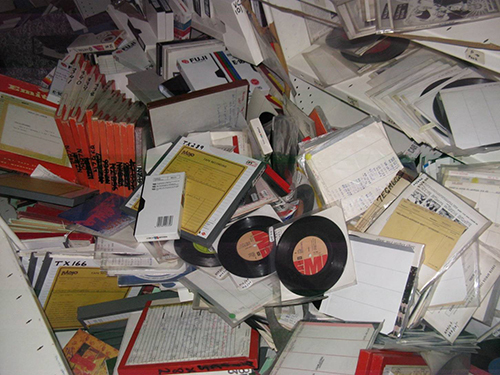 This meant it was easier to find tapes without pulling too many of them out of crates. Without the photos we would have needed a large hall to sort the collections. Nine months later we completed the sorting and we put away our blue dust coats and got back to our preservation studios. During the sort we had spotted quite a few interesting looking recordings. 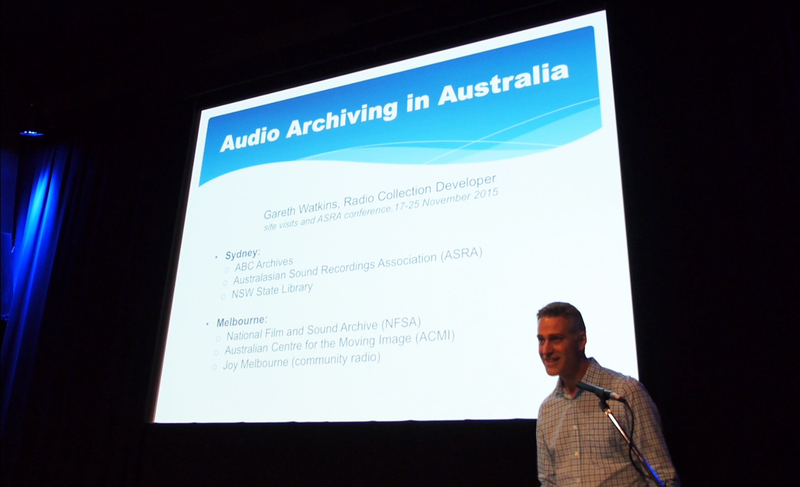 I felt really good to be back preserving historic audio in our new preservation studios. The disaster experience was both physically and emotionally challenging. In terms of our database and physical storage system we have leaped forward. The unusual sequence of large aftershocks has emphasised the unpredictability of natural disasters and the need to resource and empower people to be prepared for these events. Click below to listen to Marie O’Connell’s account of the earthquakes (interview by Gareth Watkins).